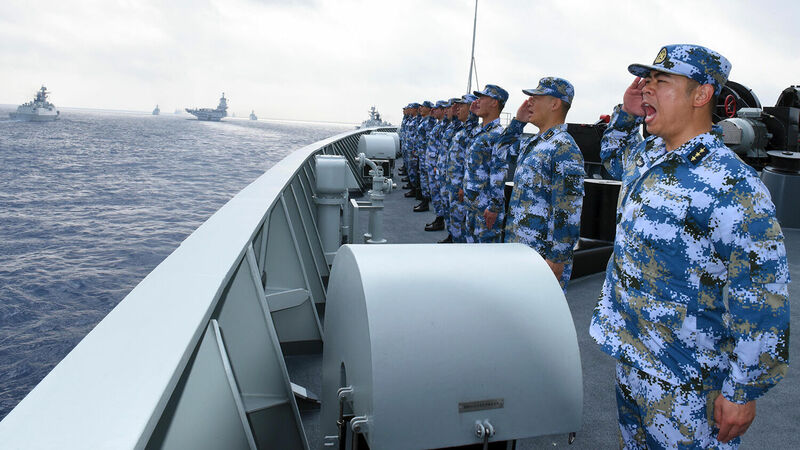 A pla Navy fleet—including aircraft carrier Liaoning, submarines, vessels and fighter jets—takes part in a review in the South China Sea on April 12. The assessment says the weapons were placed on Fiery Cross Reef, Subi Reef and Mischief Reef, all of which are in the disputed Spratly Islands. The move marks the first deployments of Chinese missiles in the Spratly Islands. It “allows Beijing to further project its power in the hotly disputed waters,” the report said. The YJ-12B antiship cruise missiles allow China to strike ships within 295 nautical miles of the bases. The HQ-9B long-range surface-to-air missiles can hit aircraft and incoming missiles up to a range of about 160 nautical miles. Only five years ago, China’s outposts in the Spratly Islands did not exist. They were partly or wholly submerged coral reefs. The Chinese used fleets of dredgers to grind large amounts of sand from the seafloor and pump it onto the reefs. They added a layer of rocks on the sand and cemented over it, transforming seven reefs into artificial islands. Analysts estimate that China has reclaimed a total of 3,200 acres of land at its Spratly locations. In September of 2015, Chinese President Xi Jinping stood in the Rose Garden in the United States and promised that China did not plan to militarize the locations. “Relevant construction activity that China is undertaking in the Nansha Islands does not target or impact any country and there is no intention to militarize,” he said, using the Chinese name for the Spratly archipelago. From the beginning, Xi’s words were doubtful. And the May 2 revelations from cnbc make a mockery of them. It is now clear that these militarized islands will function as air and naval bases, allowing China to enforce its claims not just to the Spratly Archipelago but to almost the entire South China Sea—and beyond. “The only thing lacking are the deployed forces,” wrote U.S. Navy Adm. Philip Davidson in late April. The South China Sea is among the most valuable and important ocean regions on the globe. It is immensely wealthy in natural resources, containing an estimated 11 billion barrels of oil, 190 trillion cubic feet of natural gas, and some 10 percent of the global fisheries. Even more importantly, around $5.3 trillion of trade each year flows through the South China Sea. That is more than 30 percent of total global shipping trade. Parts of this critical region are claimed by Vietnam, Malaysia, Indonesia, the Philippines, Taiwan and Brunei. Most countries’ claims are based on the United Nations Convention on the Law of the Sea (unclos), which says a nation’s territorial borders extend 200 nautical miles from its coast, and this maritime region is the country’s Exclusive Economic Zone (eez). Any natural resources found within a given nation’s eez belong exclusively to that nation. And any region that doesn’t fall within any country’s eez is considered “international waters” and its resources fair game for all. Most nations follow these international laws to determine their maritime boundaries. China declares that it has historical claims to the South China Sea, dating back to expeditions in the 1400s. The Chinese have marked the region they claim using a perplexing delineation called the “nine-dash line.” This line places almost the entire South China Sea—an area nearly the size of India—under their control. China is focusing on the Spratly Islands largely because they lie both geographically and emblematically at the center of the South China Sea. The stakes are especially high because any country that can claim the Spratlys may have legal justification for extending its eez to include the islands and a sizeable part of their surrounding waters. This would come along with exclusive rights to the area. Trumpet editor in chief Gerald Flurry has said that China’s takeover in this strategic region is “steering the world toward war.” In our July 2016 issue, he wrote about China’s island building and militarization in the Spratly area: “China is being aggressive and provocative,” and thereby challenging “seven decades of American naval dominance in the Pacific Rim.” This aggressive behavior “should alarm the world!” he wrote. Mr. Flurry’s assessment of the South China Sea situation is based on Bible prophecy. In the book of Deuteronomy, God issues a grave warning to the nations of Israel, explaining that if they reject Him, He will hand control over the world’s strategic sea gates to their enemies. And He warned that these enemy nations would use that control to besiege the nations of Israel: “And he shall besiege thee in all thy gates, until thy high and fenced walls come down, wherein thou trusted, throughout all thy land …” (Deuteronomy 28:52). China’s militarization of the South China Sea is moving toward the fulfillment of this prophecy. To understand the inspiring details of this “spectacularly good news,” order a free copy of Mr. Flurry’s book Ezekiel: The End-Time Prophet.